Batur Volcano Sunrise Trekking Activity is an exciting activity to climb up the Volcano alongside a Lake with wonderful views overlooking of sunrise on the mountain top. We are going to start the adventure to explore Batur Volcano from Kintamani area where the start point located. Heartwarming view is waiting for us on the top of Volcano Mountain. Batur Volcano Sunrise Trekking Itinerary will start with hotel pick up by our Bali tour driver around 2.00 am in the very early morning because we need to reach the start point before 4.00 am. It will took about 1 hour and 30 minute drive from Denpasar area to get to the start point. Once we arrived, the professional local guide will do a short registration and introduction about the area. Stretching and warming up is necessary to avoid any fatal injuries during the activity. It will take about 1.5 – 2 hours walking up depends on how fast we are moving to reach the mountain edge from the start point. We have to be very careful along the way due to the sharp volcano rocks spread all over the place and we are walking on the dark with flashlight in our hand. On the edge, the guide will prepare some light breakfast for us and we are going to enjoy it together with the wonderful sunrise view. Finish with the sunrise, we will going back down to the start point and heading back to the Hotel. Batur Mountain is one of the Volcanic Mountain in Bali. Bali is located in the middle of South Asian Volcanic Ring. It is also means all area of the Island is having Volcano element. And the probability of eruption is high. The mountain itself the third highest mountain in the island with elevation at 1,717 meters or 5,633 feet above the sea level. It erupted a view times in the past. The first its eruption documented was on 1804 and the last time was on 2000. Some of the big eruption spread some lava to the bottom area of the mountain. And then it is frozen later on becomes wide range black area of frozen lava rocks which called “Caldera”. On 20 September 2012, UNESCO choose Batur Caldera as a part of World Global Geopark Network. Batur Lake just situated side by side with Mount Batur bottom area. There is a water stream under the volcanic mountain which produce a natural hot spring source. And the local manage the hot spring in this area. It is a great option to have relaxation after the trekking and let the natural hot spring relaxing your muscle. Batur mountain and lake is the location for Batur Volcano Sunrise Trekking. The combination of mountain, lake, and black caldera area is a great view NOT TO BE MISSED during your holiday in Bali. Batik making at Tohpati Village is popular as the best Batik production is the island. Names of Batik itself comes from word “tik” that means “dot” or “spot” on the fabric. It is called Batik because of the making process is putting some dots on the fabric to make a certain design. The process of handmade Batik is quite long to finish. The have to start with making the design layout using a pencil on the fabric. Then put wax on the design and left only some area that will have certain color. After the first coloring done and dried completely, they will remove the wax by wash it with hot water. To do the second coloring, they will cover the parts that has color with wax. They will repeat the steps over and over depends on how many color they are using for each product. Due to its uniqueness and complicated steps, UNESCO award Batik as “Masterpiece of the Oral and Intangible Heritage of Humanity” on October 2009. Celuk Village is the center of Silver and Gold Jewelry production in Bali. Most of the jewelry made in Bali was coming from this village. Local villagers here mostly become Silversmith and Goldsmith and they have been doing this business for centuries. As the main business of the village, you may see jewelry galleries and workshop along the way and the interesting part is we are allowed to watch the local silversmith and goldsmith making their products in the workshop. Balinese Paintings has its own uniqueness compared with other styles of painting in the world. Most of the traditional Balinese paintings are taking background of legendary stories of Hindu (because Hindu is the main local people’s religion in Bali), our daily traditional ritual, and daily activities of local. A painting made by famous painting artists will have their own certificate of originality published by its painter and only painter with skillful and well famous popularity are allowed to publish the certificate of originality by the government. Wood Carving is the type of arts that combined with things which has important use in our daily life. Local people love to have traditional house, wooden home furniture, and building of the temple even the royal family palace here will having traditional carving style and we are very proud of it. No place better than Mas Village to find out the way of the wood carver crafting their masterpiece. Tirta Empul Temple located in Tampaksiring area in middle of the mountains. This temple is a special Water Temple which famous for the people to do “Melukat” ritual. The “Melukat” ritual means to clean up our body and mind spiritually. This place has legendary story about evil mind Mayadenawa King that poisoned the people and the God of Indra, God of Weather and Leader of Gods Army, stroke the land to make a holy spring water sources to cure the people. Based on that legend, Rajasimha Warmadewa King from Warmadewa Dynasty built the temple surrounding the holy spring water source and made it as a Melukat place for the people. Nowadays, the people that come to do the ritual. They also make some wishes. Such as wish of having a baby and many more wishes. You can find Luwak coffee plantation all around Bali. They will give a short farm tour about our local plantation, spices products, especially famous Luwak Coffee. Luwak Coffee produced from coffee beans found inside Luwak’s poop because the Luwak animal has a great sense of choosing coffee bean and will only eat the best quality ones. The process inside the Luwak stomach won’t damage the coffee bean but reducing the level of caffeine in the coffee. The process also change the taste of coffee produced later on. Other than Luwak coffee, you might also tasting other local spices such as lemongrass tea, ginger tea, mangosteen tea, Robusta coffee, Arabica coffee, coconut coffee, and etc. Ubud Monkey Forest is a jungle as the living place of Balinese Long Tailed monkeys or Macaca fascicularis. Due to its popularity, the forest is having over than 10,000 tourists a month. So the monkeys are familiar to have contact with people. You may buy bunch of bananas inside which the favorite food and feed the monkeys. They are ignore people who are not intend to feed them and very friendly most the time. There are several things you need to avoid with them such as direct eye contact, touch them, and reach their babies. It may leads them to become aggressive and dangerous. Ubud Palace located exactly in the center of the area and there is a traditional market in front of it. The traditional market location in the past should be located near by the royal family palace so the royal family that manage the government system in the past can control the economy activities that happen. Nowadays in Indonesia, government system is using Presidential system so the Royal Family is no longer taking care of the government system but for the local people, the royal family still have power in their cultural aspect such as ceremony of the village, social activities, and etc. Tourists that come here can visit some parts of the palace. Also it is unique and authentic architecture of Balinese building. Tegallalang Rice Terrace is one of rice terraces in Bali that famous with name “Subak”. The irrigation system for the rice terrace used in Tegallalang is an old system but very useful and effective for rice farming on the mountainous area. Due to mountainous landscape with very small flat land area, the people invented Subak irrigation system by flattened a bit of the mountain side each level and shaped them like stairs or terrace. The water system flowing from the top rice farm and continuously going down to the next level below. This irrigation system allows the local farmer to produce rice which is our main food in Indonesia. 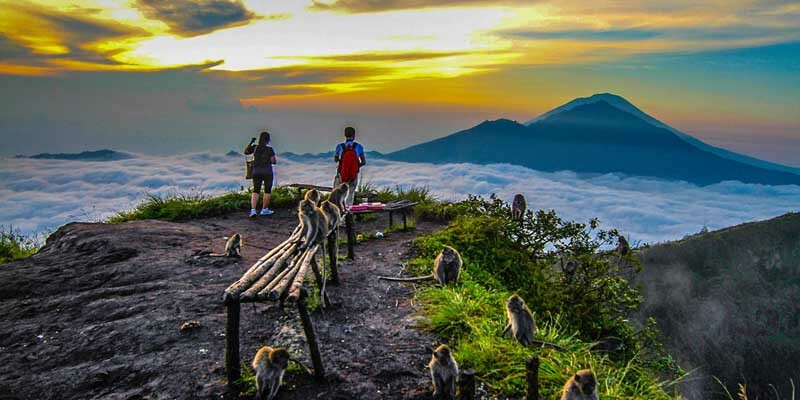 There are a lot interesting sites you can visit after Batur Volcano Sunrise Trekking activity.